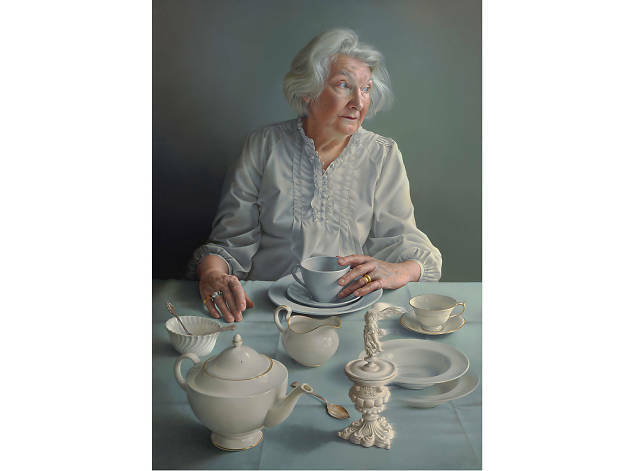 Immediately on entry to the 39th year of the Portrait Award, you’re faced with a photorealistic painting – it’s amazingly impressive, and a bit dull. Exactly what you’d expect from the Portrait Award. But this year’s prize isn’t entirely filled with the usual same-y works, the ones we all gawp at for their makers’ ability to use paint like a camera. It feels like this time the judges have loosened up a bit and thrown in some wildcards in an attempt to give us a broader view of what a portrait can be. ‘Time Traveller, Matthew Napping’ by Felicia Forte is a scene-stealer. It’s personal and provocative, a portrait of a figure, faceless and laid up in bed with the red light of his room shining on our faces. The bigger works like this understandably demand attention, but it’s in the smaller ones that you’ll see some of the most experimental stuff. ‘Ako’ by Nikita Sacha is about video-calling and replaces a face with a frustrated abstract blur. ‘Charlie Masson’ by Alvin Ong feels like a trippy take on Van Gogh’s post-impressionist aesthetic. ‘Dad’s Last Day’ by Nathan Ford is a heartbreaking part-sketched, part-painted scene of the artist’s dying father. Upstairs, Caspar White uses scrap envelopes, record sleeves and brushed steel to capture the moods of the Berlin and Mallorca club scene. His works move between nights raving and days hanging – an unlikely but welcome narrative in the NPG. I try and get to this exhibition every year and after a slightly disappointing year in 2017 this one really exceeded expectations. There was a good variety of different styles, subjects and moods and some real stand out pieces for me. My only criticism would be the actual organisation of the exhibition. They’ve moved it to a different part of the gallery this year and it’s really unclear which is the way in and which is the exit, leading to a lot of people going round the wrong way. Luckily it was quiet when we visited but I can imagine this would be more problematic busier periods. There were no staff on the door which would have helped the problem and also meant that when several school groups came in there was no volume control so it was disruptive for other visitors. Finally, I noticed a lot of the explanatory plaques next to each work had spelling errors or missing words - while I’m aware this is quite a personal bugbear for me it was quite disappointing to see and not something I would have expected - suggested that it was a bit rushed and not put together with thought.